Obama also announces Clinton administration veteran will be "health czar"
WASHINGTON (CNN) -- President Obama announced his choices for two key health care positions on Monday, tapping Kansas Gov. Kathleen Sebelius for health and human services secretary and former Clinton administration official Nancy-Ann DeParle as White House health care czar. Sebelius said that health care reform "isn't a partisan challenge; it's an American challenge." "If we are going to help families, save businesses, and improve the long-term economic health of our nation, we must realize that fixing what's wrong with our health care system is no longer just a moral imperative, but a fiscal imperative," Obama said at the White House. "Health care reform that reduces costs while expanding coverage is no longer just a dream we hope to achieve -- it's a necessity we have to achieve." Obama also announced the release of $155 million in stimulus package funds to establish 126 new health centers. The centers will be designed to help provide primary and preventive health care services to people without health insurance. They also will support 5,500 new jobs, according to a White House news release. Obama's first pick for the HHS post, former Senate Majority Leader Tom Daschle, withdrew in early February after questions arose about his failure to pay about $100,000 in taxes he owed on a car and driver loaned to him by a friend and business partner. Sebelius, a two-term Democratic governor in a Republican-leaning state, previously served as a state insurance commissioner and oversaw Kansas' Medicaid program. She has been credited with boosting health care assistance for the poor during her tenure. If confirmed by the Senate, Sebelius would take office as the Obama administration begins its health care reform drive. Among other things, Obama is seeking to set aside $634 billion in a health care reserve fund over the next 10 years to help move the country closer to the goal of universal coverage. He also would require seniors making more than $170,000 annually to pay a greater share of their prescription drug costs under Medicare. Health care reform "isn't a partisan challenge; it's an American challenge," Sebelius said. Her assertion was supported by the endorsements of former Senate Majority Leader Bob Dole, R-Kansas, and Kansas GOP Sen. Pat Roberts -- who both attended the announcement at the White House. 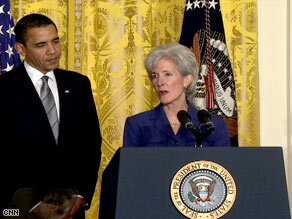 Officials have said Sebelius has a good personal relationship with Obama and was considered for other Cabinet posts. The Kansas governor endorsed Obama in January 2008 and helped him court female voters, Midwesterners and moderate Republicans. DeParle is currently the managing director at CCMO Capital, a private-equity firm. She is also a member of the Medicare Payment Advisory Commission, a group that advises Congress on Medicare payment and policy issues. Administration officials say the White House health care czar position will be similar to the role Hillary Clinton played when, as first lady, she attempted to overhaul the health care system. But officials also have said Obama's approach will be different from that of the Clinton administration. Instead of creating a detailed plan and presenting it to Congress, the new administration intends to present an outline of health care reform and work closely with Congress to hammer out the details.